Horse halters come in four basic sizes: pony, cob, horse and draft. Halters are moderately adjustable within each size and higher end halters allow the noseband, throatlatch and crown piece to be adjusted independently. You need to measure your horse's head before you go halter shopping so you can purchase the best-fitting halter available. Place one end of the tape measure at the midway point between your horse's cheekbone and his nostrils. Stretch the tape measure across the nose to the corresponding point on the other side of your horse's head. Record the measurement for your horse's noseband area. Starting at the same point between the cheek and the nostril, stretch the tape measure underneath the horse's head to get the measurement for the bottom portion of the noseband. Record the measurement in your notebook. Place the end of your tape measure directly below your horse's cheek bone on the side of his face. Stretch the tape measure around the horse's head to the corresponding location on the other side of his face. Record the measurement for the crown piece of your halter. Place the end of your measuring tape several inches behind the horse's eye near the top of his throat area. Measure underneath the throat to the corresponding area on the other side of his face. Record the measurement for the throatlatch area of your new halter.  When you go halter shopping, compare the measurements you have taken to the actual measurements of the halter. Halters will vary slightly in size depending on the manufacturer. You can either measure the halter yourself using your measuring tape or accept the manufacturer's measurements if they are listed. 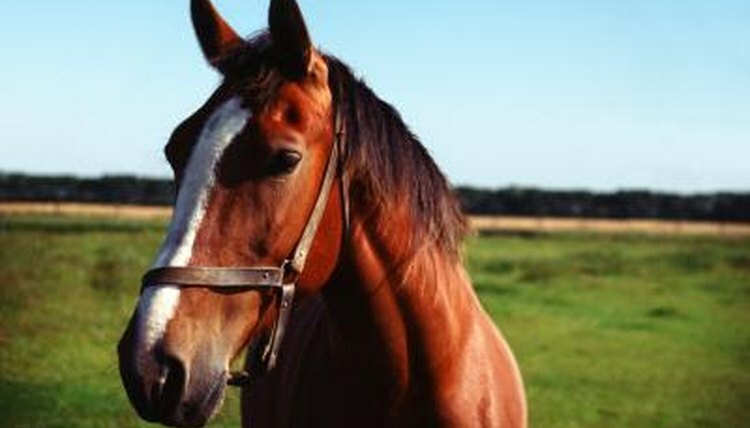 If you own a horse who is difficult to fit, you may want to measure the halter yourself.